An attachment for today’s modern skid steer loaders, the split top grapple rakes’ design has dual upper grapples for holding brush, debris, and odd shaped items while leaving the dirt behind. 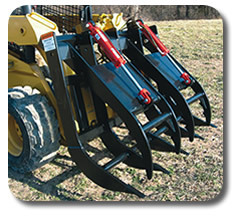 The skid steer grapple rake attachment is ideal for loading logs, piling brush and other hard to handle materials. Unique tine design with replaceable weld-on tine points allow operator to go under logs/brush for easy clean pick up. Shield plate in upper clamps provides protection for hydraulic cylinders and greaseable pivot points on upper clamps offer long service life. View our literature. Ideal for loading logs, orchard prunings, piling brush and other hard to handle materials. Unique tine design with replaceable weld-on tine points. Tine points allow operator to go under logs/brush for easy clean pick up.